Decompile mdl to get the smd animations. Push the smd ref and animation into %GAME_PROJECT_SRC%/modelsrc/ directory. 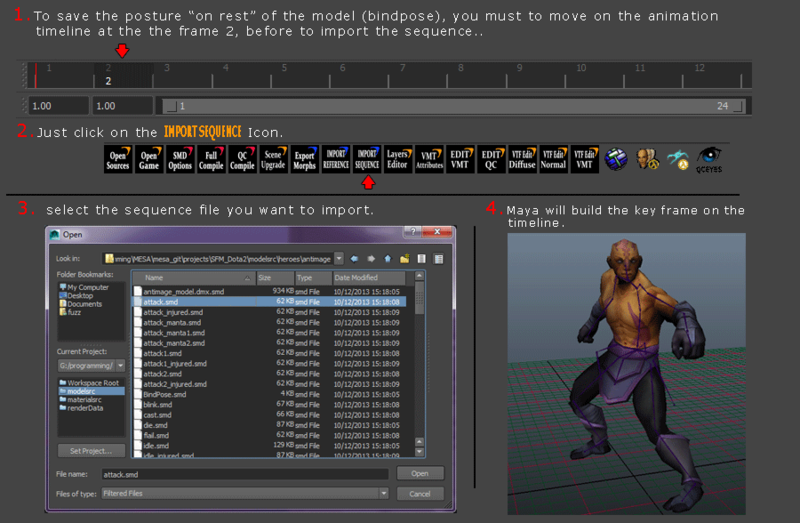 Open maya and set the current maya project on dota 2 workspace. 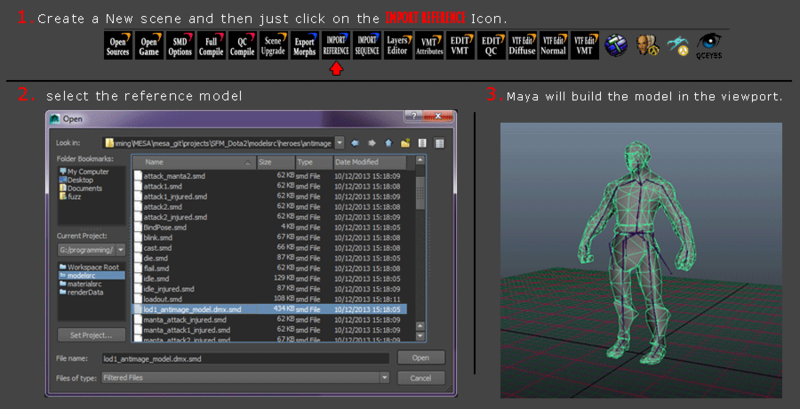 Importing a heavy smd reference file could take few minutes for Maya to built the scene by the script way. You can follow the process from the output window (trace). Click on the import SMD icon, and from the file dialog . Do not forget to convert the VTF in a TGA format file and also put the file into the right place in /materialsrc/. When reading the smd file maya script SMDMakeHL2Shader.mel will fail to find the TGA, because the script do not read into the QC file to determine the path set on the $cdmaterials command. You will have to load the TGA file(s) manually from the phongE shader(s) on the model. You can’t save your scene at that moment, cause the scene contains an “UnknowDag Object” that make the saving impossible in maya ASCII format, any way you can save in maya Binary format. So if you are done and just would like to import a none animated model, you must to delete the transform1 and the unknowdag1 node directly from the Outliner ( select and delete key on keyboard). If you wish to import some animations on your reference model, you must to save the maya scene into maya binary format, cause maya AScii format can’t to save the data contained into this unknowdag object keep that node into your scene. You should want to learn now how to import smd files into maya using MESA, click here (incoming) . Open the outliner and look for the “Tranform1” node, open the hierarchy by clicking on the small +, and you will see a unknowdag1 node. this will will prevent you to save your scene., this “unknowdag” must be rename from “unknowDag1“, to “unknowDag”( without the number at the end). try to import a smd animation again and the error should have disappeared. 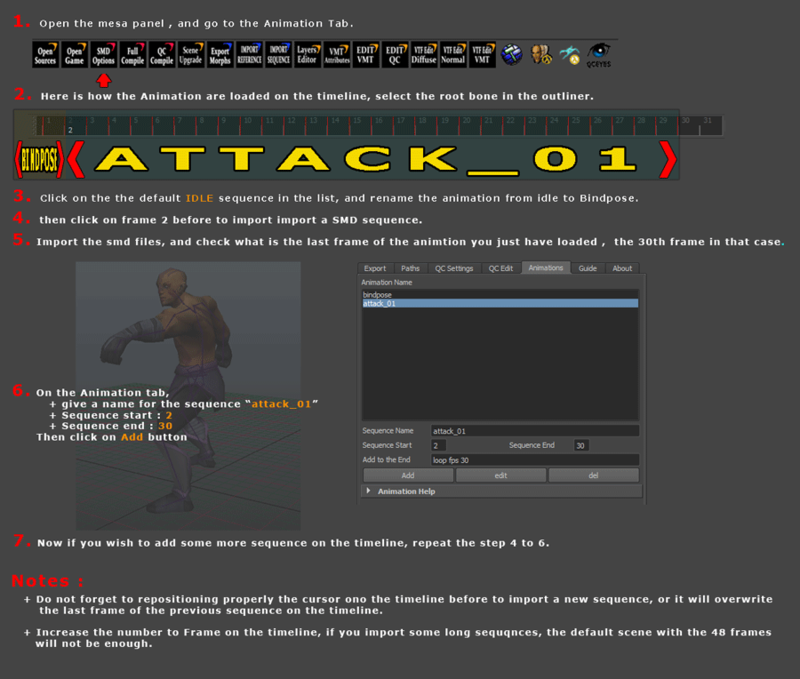 You should want to now learn how to set up your items/weapons into maya , before to export it, click here (incoming) .